In engine oil, the element composition and concentration changes as the engine operates. A rapid and effective detection of these changes, therefore, is needed to prevent accidents. 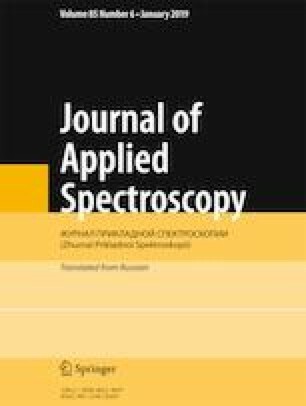 Indirect ablation laser-induced breakdown spectroscopy (IA-LIBS) is a new technology introduced specially for oil samples. In this paper, 5 different oils are used for the analysis. The matrix effect on the calibration curves of analytical elements (Cu, Ti, Fe, and Ni) in these oils is investigated. The results show that the matrix effect is reasonably negligible under the conditions of our experiment. A generalized calibration curve can be established for analytical metals in different types of oils. We use the generalized calibration curves established to determine the concentrations of Cu, Ti, Fe, and Ni in mixed oils. The IA-LIBS results show that good agreement is obtained between the measured and known values. Published in Zhurnal Prikladnoi Spektroskopii, Vol. 86, No. 1, pp. 51–57, January–February, 2019.